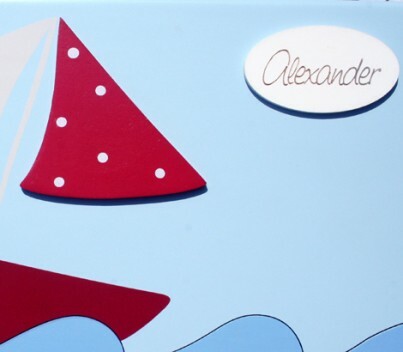 Personalised Boat Keepsake Box by Freya Design - A high quality wooden keepsake box for boys to keep their special things and keep their rooms tidy. 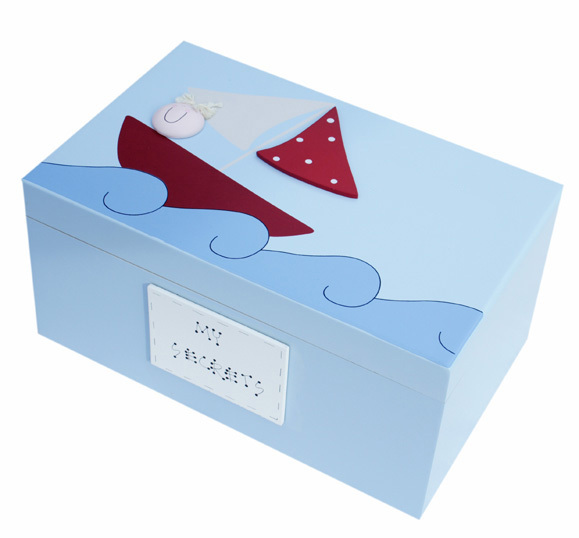 This keepsake box makes a delightful gift for a special occasion such as special Birthdays, Christening, Christmas, First Holy Communion, etc. 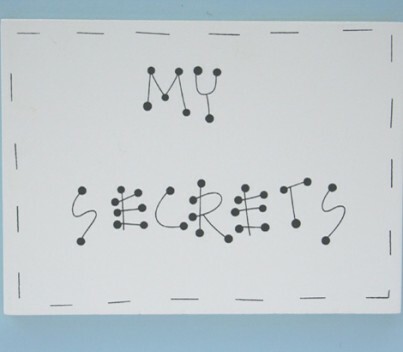 The memory box has a hinged lid with a magnet shut and comes with a standard message on the plaque outside My Secrets. The box can also be personalised with one name which is included in the price. It also has a blank wooden plaque inside where you can write your own personal message with a permanent pen. If no personalisation required please type none in the personalisation box. Made from: Wood, textile and other natural materials are used to achieve the unusual 3D designs that are the trademark of Freya Design Keepsake and Memory Boxes. This product is painted with non-toxic paints. The different types of wood are only sourced from countries where there are strict regulations regarding sustainability. All materials used are carefully sourced from around the world and the environment is always the main consideration when making decisions. Delivery is normally by national courier services within 3-4 working days if non personalised and 7-10 days if personalised with name /date. 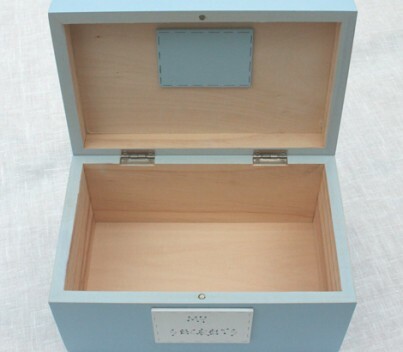 Wooden boxes are quite heavy and orders will be carefully packaged and posted to any address in the United Kingdom at a standard cost of £6.00, regardless of how many products are ordered. This charge is shown during the credit/debit card payment process (and on the mail order form if paying by cheque). Freya Design uses mainly courier and sometimes Royal Mail to deliver your parcel(s). Orders for non-personalised products will normally be dispatched within 3 working days of the order being placed. Orders for personalised products will normally be dispatched within 7-10 days of the order being placed. Rest of the world - for deliveries to countries other than the United Kingdom, postage charges and delivery times will vary according to destination, so please contact us for a quotation before you place your order. General Please note that as all our products are made from solid wood, surfaces will never be perfectly smooth due to natural imperfections in the wood - unlike MDF. Also bear in mind that wood is a live material which may move slightly with time. A website cannot convey a 100% accurate reproduction of some of the colours used on the products. If for some unforeseeable reason products are unavailable and your order cannot be fulfilled, you will be contacted and offered substitute products to the same value or a refund. Freya Design can only be held liable for any loss up to the value of the good(s) purchased. We will not be held responsible for any losses resulting from your use, or inability to use our website. Our products are not toys and are not intended for use in play. Damage in transit must be notified within 24 hours of receipt. If products are faulty they should be returned within 7 days of receipt and the reason(s) for returning the good(s) should be clearly stated. Freya Design will pay for the postage. Customers will be offered either replacement good(s) or credit. In accordance with the Distance Selling Regulations, if an order is cancelled, written notice and return of the good(s) to Freya Design by recorded delivery must be carried out within 14 days of receipt of the good(s). The cost of postage and packing shall be borne by the customer. Refunds will be paid within 30 days of receiving the written notice of cancellation. Freya Design reserves the right not to offer refunds on items that have been designed or personalised at the customer's request. Your statutory rights are not affected.